One thing that marked my childhood was hearing Billy Graham preach several times. I saw him preach at the Kingdome in Seattle in 1976 to a capacity crowd, the largest crowd in the history of the infamous dome. I saw him preach in Spokane as a teenager and saw him in his last Crusade in his final visit to the Tacoma Dome in 1991. I remember being impressed, even as a child with his boldness and courage in the pulpit – characteristics that never faded from the world-famous evangelist. 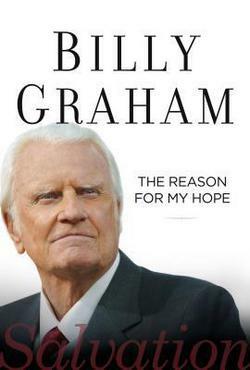 Boldness and courage are two words that describe Dr. Graham’s most recent offering, The Reason For My Hope. After seventy years of ministry, the message remains the same. The message is the simple gospel message that Christ came to die for sinners, securing forgiveness and eternal life for anyone who believes. Graham weaves personal stories and anecdotes throughout his gospel presentation. The narrative is warm. The message is compelling. It is no secret that Billy Graham proclaims a message that is peppered with doctrinal convictions that find a home in the Arminian camp. The debate between Calvinists and Arminians will likely continue until the coming of our Lord. I still have fond memories of seeing Billy Graham preach the Word of God. I have since come to some soteriological conclusions that differ from Graham. But my respect for the man has never wavered. Billy Graham is a consistent, faithful, Christ-follower. He has finished the race strong. He is a faithful witness to the reality of Jesus Christ and his gospel! I, too, have memories of Billy Graham all through my growing up years. I never attended a crusade, but saw several on TV. I liked the way he always held his Bible in one hand, never laying it down. On his seventieth birthday he made the cover of both Newsweek and Time (I believe) and neither magazine had anything negative to say about him. And that in itself says a lot. I believe he fulfilled God’s call to the best of his ability, and did it with grace and humility.